“Because You Care” Hospital Foundation Lottery Now on Sale! Published on March 23, 2018 at 12:00 am . CAMPBELL RIVER, BC, March 26, 2018 — It’s that time of year again! 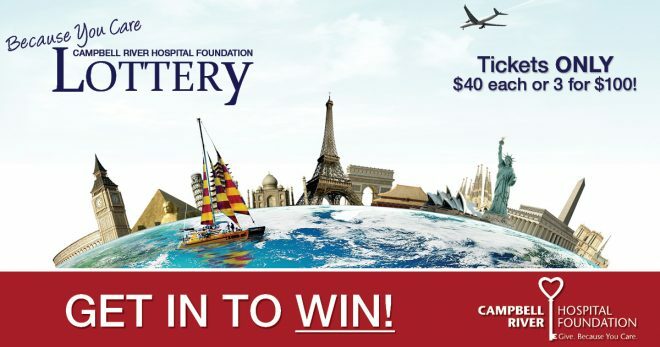 Tickets are now on sale for the Campbell River Hospital Foundation’s annual lottery. This is your chance to help support quality health care in Campbell River, all while having a chance to win one of three amazing prizes, valued at nearly $30,000! With only 2,750 total tickets, and on the heels of a sellout in 2017, you’re encouraged to buy as soon as possible to avoid disappointment. The grand prize for the Lottery is an enticing $10,000 Cash and a $10,000 Travel Voucher. The 2nd prize is $2,500 Cash and a return trip for two to any scheduled West Jet destination and the 3rd prize is $1,000 Cash and an all-inclusive trip to the Mayan Riviera, Mexico. Tickets are now available and can be purchased online and with various retailers. Details are available on the Foundation website. Winners will be drawn on June 1st at 12:00PM. Visit the Because You Care Hospital Lottery for prize details. Order online or by phone at 250-286-7164 (Toll-Free: 1-855-550-2418). Funds from this year’s lottery will be supporting women’s health and will be used to purchase a Hologic Myosure Tissue Removal System. This system provides clear visualization into the uterine cavity, can resect unwanted uterine tissue with the use of a blade and fluid management system, provides better tissue contact for efficient tissue removal and to minimize the risk of perforation, which maintains uterine form, uterine function is preserved and collected specimens intact. This one system helps with many procedures and treats a wide range of intrauterine pathologies. The Campbell River Hospital Foundation is a registered charity dedicated to raising funds to support our hospital and Yucalta Lodge through equipment purchase, staff education and special projects that help enhance the service and treatment of patients and residents. Published on November 11, 2017 at 12:00 am . VANCOUVER, BC, November 11, 2017 — The Grand Prize winners may have been named, but that doesn’t mean the winning is over for the 2017 BC Children’s Hospital Dream Lottery. If you snagged a ticket to the cash calendar, you’ll want to keep that handy- winners begin to be announced today, November 11, until February 9, 2018. Stay tuned for all the winners here on Home Lottery News. See full article for details. Tickets now available for the Vancouver Opera 2018 Winter Lottery! Published on November 9, 2017 at 4:45 pm . VANCOUVER, BC, November 9, 2017 — The Vancouver Opera Lottery is back to offer excitement for all Vancouverites this winter season. Only 5,000 tickets are up for grabs — with those kinds of odds and the chance to win a brand new Audi, cash, cash, and more cash, you won’t want to sleep on the chance to snag a ticket. See full article for details. Published on November 2, 2017 at 3:00 am . Tickets for the 2017 Millionaire Lottery are now on sale! Published on October 30, 2017 at 12:18 pm . 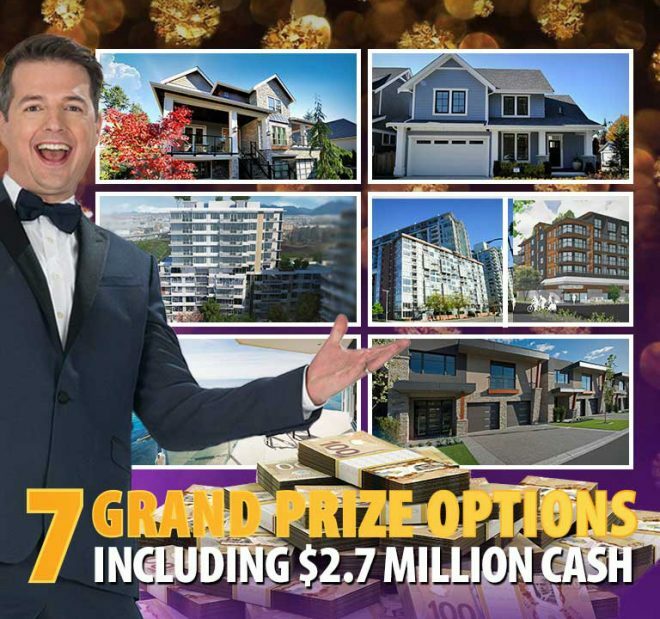 VANCOUVER, BC, October 30, 2017 — The Millionaire Lottery sure lives up to its name; with seven Grand Prize options including $2.7 million cash, winners will be rich with cash and rewards… over $4.3 million in prizes to win in the main lottery alone! Best of all, all the money raised stays right here in BC! Order your tickets online, or call 604-602-5848 or toll-free 1-888-445-5825. Just take a look at these seven incredible prize options for the Grand prize winner. The Elgin Estates package, worth over $3.3 million, includes a house fit for a royal family. A gym, recreation and media rooms, library, gourmet kitchen, 6 giant bedrooms, and much more awaits the winner in this 6,146 square foot home, which is move-in ready with over $140,000 in luxury furnishings and appliances and $20,000 cash to do with as you please! The Ocean Park package where you’ll be just a hop, skip, and a jump away from the ocean! Worth over $3 million, this package includes an elegant craftsman style home with plenty of room to breathe with its large ceiling great room, four bedrooms and bathrooms, relaxing master bedroom, and recreation room that’s ready to entertain. Plus, this package comes with $500,000 cash, over $100,000 in furnishings, a 2018 Tesla Model X, a 2018 Jaguar F-Type Convertible, AND a 2018 Coachmen Prism Elite Mercedes Benz Sprinter 3500 Motor Home. Talk about sweet bonuses! Option #3 is a contemporary three bedroom condo in Richmond, close to Vancouver but far enough away to revel in living in this landmark community. The prize comes with a new 2018 BMW x4 xDrive 28i AND a 2018 BMW 230i Cabriolet xDrive PLUS a whopping $1.725 million to spend on what you may! Worth over $3 million in total! Option #4 is the best of both worlds – a two bedroom condo in downtown Vancouver near beautiful False Creek, AND a loft condo in Squamish. Plus the package comes with over $30,000 in furnishings for the Squamish condo, a 2017 BMW i3, a 2018 BMW X5 xDrive 35i, AND $350,000 cash. This package is worth over $2.9 million. Option #5 is a slice of lakeview paradise in Kelowna, that could be your new summer playground. This three bedroom home offers you 3,811 square feet to make a lifetime of memories in, especially since you’ll be steps from Okanagan Lake. Say hello to water sports, sandy beaches, and plenty of local wine! Including the $75,000 furniture credit and the Land Rover Discovery Diesel, this package is worth over $3 million. Option #6 is a beautiful SookePoint ocean cottage that invites you to enjoy the magnificence of the ocean every day, or you could even rent it out for some extra income! The prize comes with a 2018 Audi SQ5 SUV, a 2018 Audi RS 7, PLUS $1.75 MILLION CASH. Option #7 is a ticket to the multi-millionaire club, with $2.7 million tax free cash in your pocket! The first deadline is for the Loyalty Bonus prize. The winner will have a choice between a 2018 Honda HRV-LX 4WD, OR a $25,000 vacation/travel gift card + $5,000 Cash, OR $25,000 cash. The deadline to enter is November 10, 2017. Winner will choose one prize option; other prize options will not be awarded. The 50/50 jackpot was a whopping $1,645,560 last year and can climb to an astounding $2,200,000 this year! Winner takes half. The Daily Cash Plus promises 62 winners that will be drawn from February 6 to April 8, 2018 and will walk away with $3,000 cash. On April 9, 2018, one Ultimate Daily Cash winner will receive $50,000 cash. Published on September 22, 2017 at 3:06 pm . PRINCE GEORGE, BC, September 21, 2017 — What would you do with an extra $40,000 lining your pockets? Would you update your winter wardrobe now that the days are getting cooler? Or would you escape the cold and jet off to somewhere warm and tropical? If you’re the winner of the 2017 Spruce Kings Show Home Lottery Pre-Season Mega 50/50, the hardest decision you’ll have to make is what to do with all of that money. Tickets are on sale now until October 22, 2017. See full article for details. Published on September 20, 2017 at 12:00 am . FORT ST. JOHN, BC, September 20, 2017 — It’s time to put away the Summer clothes and welcome Fall, which means the chance to win $20,000 in the 2017 Rotary Mega Lottery! Get the most out of your ticket with the Early Bird draws and play the 50/50 for a shot at up to $50,000 cash. Tickets on sale now. See full article for details. Published on July 31, 2017 at 12:00 am . VANCOUVER, BC, July 31, 2017 — Get your ticket handy, the 2017 Hometown Heroes Lottery final draws are just around the corner! The Grand Prize will be awarded, and one of the six prize options will be snagged up. There is also the 50/50 to be won, which reached a jaw-dropping $1,685,985. Will you be a winner? See full article for details. Tickets now available for the 2017 Vancouver Opera Lotteries – Summer! Published on July 25, 2017 at 4:53 pm . VANCOUVER, BC, July 25, 2017 — Want a shot at a brand new BMW? Or how does $50,000 cash sound? With only 5,000 tickets available, you’ll want to get your hands on these newly released tickets. Also, grab a 50/50 ticket for a shot at up to $20,000 cash!See full article for details. Published on July 6, 2017 at 8:29 am . KAMLOOPS, BC, July 6, 2017 — Tickets were hot for the Kamloops YWCA and YMCA Dream Home Lottery this year! The sold out lottery has announced their Grand Prize winner, following the draws on July 5. Did you get lucky? See full article for details.